Your Birth Order Matters. But Not in the Ways You Might Think. It's one of our culture's greatest psychology obsessions: whether the order we're born into families actually affects our personality. For many people, birth order is a means of passing the buck on less-than-great adult behavior ("I can't help being bossy, I'm a firstborn"). But can you really blame them? Birth order theory is perpetuated everywhere in real life and on TV. Just look at the Kardashians -- Kim is basically the prototype of an attention-seeking middle child, and of course there's the spoiled "baby" of the family (yes, Rob, that's you). Shrinks have been studying this for close to a century now, with a lot of mixed results. We talked to experts to find out where the theory stands, and if your bad (and good!) behavior is really your birthright. Since the 1920s, when Alfred Adler -- an Austrian psychiatrist and Freud follower -- introduced it as a significant factor affecting behavior and personality, birth order psychology's veracity has caused many disputes. That's why psychiatrists are still studying its effects, especially within familial twists like patchwork and single-parent units, and clans that have a lot of kids. Basically, the Duggars would probably make for the wackiest possible study in birth order. 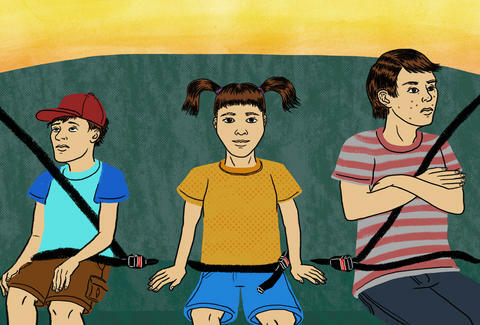 According to Daniel Shaw, a professor in the University of Pittsburgh's psychology department specializing in early development, the effect of birth order on personality is centered on parents, and how they help children navigate their spot in the family. "What's important to remember about birth order theory is that it's not destiny," he says. "But order is in there somewhere. For example, we know that one of the issues, in a very primitive sense, is if kids grow up in poverty, the risk (of behavioral problems) raises with the number of kids. It's not to say if you're the oldest you're going to turn out being this way or that, but it does say something about resources." This is one of birth order theory's most repeated claims -- that getting special attention makes firstborns reliable and structured at their best, and know-it-alls and overachievers at their worst. Some research has found that firstborns do tend to score better on intelligence measures, but alas, science shows that older siblings can actually have a more difficult time developmentally. Shaw, who also specializes in child conduct problems, says that with certain assistance, second and third children may be the beneficiaries of more informed parenting. His latest research, which hasn't been submitted for publication yet, deals with providing counseling to parents who have youngsters with developmental and behavioral issues. So far, it shows that when parents received help and advice for latter-born children, those children developed even more smoothly than firstborns. "We found our intervention worked a little bit better in preventing problem behaviors with second or third children," says Shaw. "Parents who had already parented one child really got the message and were more motivated, already having those skills in place." Considering firstborns are also prone to have conduct problems when a second child is born, it might just explain why your big bro or sis is so dang neurotic. Obviously when kids fly solo in their families, the effects are drastically different compared to families with multiple children. So duh, there's such a thing as only-child syndrome -- but what exactly that means is still quite a mystery. Some studies suggest that singletons do better academically and socially than children with siblings, but there are others that show the exact opposite. That's science for you! "There's no question that being an only child is very different," says Shaw. "It does come down to parenting again. If you're a parent of (multiple children) one of the biggest issues is setting limits… You have to draw a line in the sand… and enforce the same rules for all children. Otherwise they feel like this or that is unfair because the younger or older one didn't get it, which can have long-term effects." One of the most comprehensive recent studies on birth order reviewed data on more than 20,000 adults from the United States, the UK, and Germany. Researchers focused on what's known as the "big five" personality traits -- extroversion, emotional stability, agreeableness, conscientiousness, and openness to experience -- to reach the bright, shiny conclusion that birth order doesn't have any influence on personality after all. According to the report, researchers couldn't find any pattern of personality traits based on where a person fell within their family; it didn't matter whether the data was lumped together or separated by country. "It's extremely hard to publish a study with negative results, because that's not what people are interested in hearing," says lead researcher Julia Rohrer. "So we were careful to make it as solid as possible, having siblings each rate themselves instead of one sibling rating all their brothers and sisters like a lot of other birth order studies." You can probably see how studies that ask siblings to rate each other could go awry. Rohrer says it's possible that the stereotypes of birth order we see all the time could be a case of self-fulfilling prophecy: parents may knowingly or unconsciously raise their children with birth order in mind, which is also influenced by society and stereotypes. As one child shows a personality associated with birth order effects, the rest could just carry on to follow suit. "What we can rule out is that birth order effects are caused by a universal phenomenon," Rohrer points out. "Because if that was true we'd have been able to find it in one of three countries, but it just wasn't there. But I don't think you can generalize our findings to all cultures either." Shaw agrees that the next big study in birth order should be in China, where the government's one-child policy was changed to a two-child policy in January. "China is the great experiment," he says. "Because now you're dealing with parents having one child for more than a decade. It's going to be a great place to study (birth order), especially how those firstborns adjust to new children now." Barbara Woolsey is a Berlin-based writer who has only-child syndrome. Whatever that is. Follow her on Facebook and Twitter.